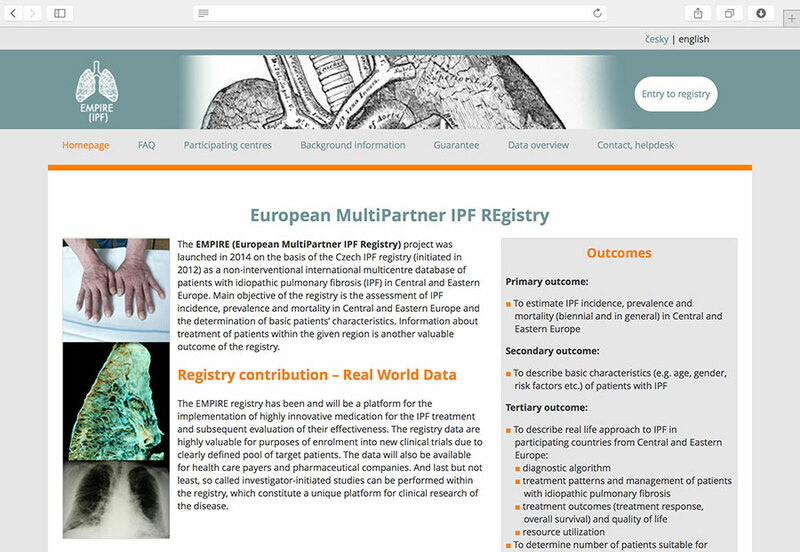 The EMPIRE project is an international, multicentre, observational, non-interventional registry of IPF patients in the Czech Republic and Central and Eastern Europe. According to the American Thoracic Society (ATS) and the European Respiratory Society (ERS), the idiopathic pulmonary fibrosis is defined as a specific form of chronic fibrosing interstitial pneumonia which affects exclusively lung parenchyma. Key characteristics of the disease involve abnormal histological findings (usual interstitial pneumonia, UIP) on surgical lung biopsy, exclusion of all other causes of interstitial lung disease, restrictive pattern of lung function and/or restriction of gas exchange and radiologic (X-ray, HRCT) abnormalities and negative BAL examination. IPF is considered to be a relatively rare disease; however, most recent studies dealing with this topic suggest that the incidence might be significantly higher. to estimate IPF incidence, prevalence and mortality in Central and Eastern Europe. to describe basic characteristics (e.g. age, gender, risk factors etc.) of patients with IPF. Expert guarantor: Assoc. Prof. Martina Vasakova, M.D., Ph.D.